Quite soon after the inception of this blog, data from the PIOMAS model became a prominent element in discussions on ice thickness and volume. Though corroborated by on-the-ground observations and satellite data, PIOMAS remained a model and so practically everyone was careful in not attaching too much importance to the numbers that showed a staggering decline in volume over the last decade. In the past two years, however, more and more evidence has been accumulating, showing that PIOMAS has it largely right.This year and last year we've seen total ice cover declining even when weather patterns would suggest the decline should stall. Moreover, it was recently announced that preliminary observational data from the CryoSat-2 satellite more or less confirm the PIOMAS modeled data. Regular commenter Chris Reynolds recently acquired more detailed PIOMAS data and has since then been crunching numbers in Excel, putting out graphs that might increase our understanding of recent crashes and might help to predict what will happen in years to come. Tamino has just posted about 2010 and what he's found in the PIOMAS volume data, this has driven forward the need for these posts. I think that people aren't aware enough about what happened in 2010 and that understanding it is key to understanding where we are with regards Arctic sea ice, and where we're headed. I am asserting that 2010 was a key event, one with repercussions for the future, that will be seen in years to come as important a turning point as 2007 itself. Indeed 2010 may even have ushered in what Dr Peter Wadhams has said probably be a succession of crashes: "I think the next two or three years will see a further collapse and we'll then be encountering an Arctic ocean without sea ice in it during the summer months" BBC News 24, 19:23 27/8/12. A year ago I'd have disagreed, now I think he may be correct. Key to answering the question of what happened to the thick ice is the question of when it happened. The following graphic is the volume series for years 2006 to 2012. 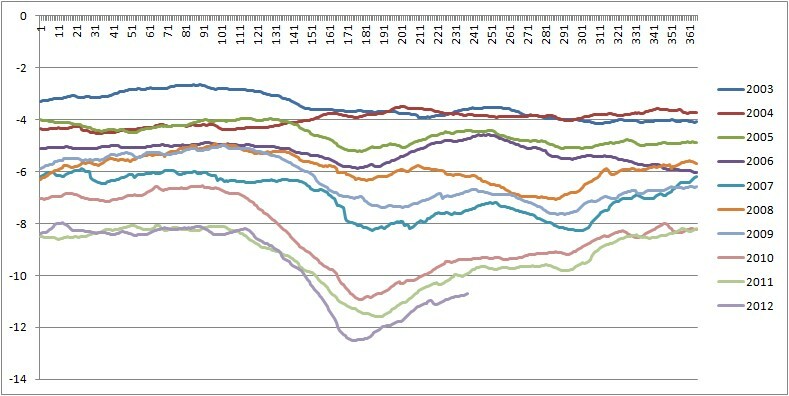 This shows that the years plotted fall into two groupings, years after and including 2010 are clearly below the rest. This happens from approximately day 115 (26/4/10) to 160 (10/6/10), when the plot for 2010 moves from one grouping to the other. This would suggest that whatever happened, it happened in May 2010. But the numbers show that the process was not as clear cut, yes the largest volume drop, creating the deviation from previous years to 2010 happened in May, but more happened before. I'm sure there will be more to come, so keep an eye on the Dosbat blog. Chris Reynolds' contribution is especially valuable since because for the first time we have data on the spatial distribution of Arctic sea ice, rather than just total volume and average thickness. When compared to charts showing how sea ice concentration progressed during Summer 2012, this data may provide some insight into the future evolution of the Arctic ice pack. Thanks for your hard work Chris, and also to Neven for highlighting it. Great work, fellows! This was helpful in grappling with MYI change. It does make us more aware that what happens in the winter months sets the stage for summer melt. More significant ice loss may be coming soon. The 090612 NRLSCC forecast ice motion depicts a strong low over the CAB, driving ice through the Fram, then churning into the CAB 090712 and dissipating 090812. I am making the assuption that this is the SLP currently over Iceland. One should not be commenting at 4:30 am on 3 hours sleep! Notice Barnes icesheet on the middle left side? Got a first snow cover day 244. Would the fate of that little rest of the great Laurentian Icesheet prelude that of GIS? Great post, Chris. btw I think you mean "if the surface temperature rises, that heat flux reduces... "
The hunt for a sole silver bullet is tantalizing. But if we assume that the big volume drop in 2010 was caused by an interaction among several elements rather than mainly by a single one (such as WACC), we may find other clues implied by successive y/y changes. Re: FYI frozen onto bottom of thick ice - during the the day 140 - 170 interval, aren't we looking at slower formation of this FYI rather than faster melt? In the month before the solstice, total volume has been roughly flat in recent years, while area/extent accelerates downward: so freezing must be occurring within the pack. If so, the lower heat flux through thicker ice would support crandles' hypothesis, not counter it. Maybe comparing the time-shift in downtrends will yield some insight. Following the big drop in ice thickness in 2007, the downslope in volume anomaly has been earlier and/or steeper than before. This seems consistent with either less-rapid freezing of FYI under thick ice (each passing year, less MYI where this can form) or with more rapid progression of edge melt from the peripheral oceans to the Arctic Basin (@Chris R 3 September 2012 10:22 on Dosbat blog). there's a deviation from Feb-Apr 2010 that seems plausibly explained by WACC. But as pohjois noted in the Tamino blog, "it is year 2009 which is the first example of the new regime – maximum early in the season..." So it looks as though WACC was additive to some influence on ice thickness that was already operating in summer 2009, with possible foreshadowing in prior years. The blooms may better be described as phytoplankton blooms. Algae are just one of several types of organism making up phytoplankton, and there are several different types of algae. In Foxe Basin and Hudson Bay, this abstract says phytoplankton make-up in late summer varies, with some areas dominated by small flagellates and rich in chlorophyl (I guess rich in green algae), and some including Foxe Basin are diatom-rich areas. Chlorophyl bearing phytoplankton (I guess mainly green algae)usually dominate in the arctic in the earlier part of the summer. This paper shows typical scientific reticence in text and title "Are phytoplankton blooms occurring earlier in the Arctic?" The paper shows clearly that the earlier season, chlorophyl-rich, blooms are occurring earlier in arctic waters, with unknown consequences for arctic food webs..
blooms can expand into other areas of the Arctic Ocean and impact the whole food chain. As secondary producers, such as zooplankton and shrimp, may have adapted their reproductive strategy to match the annual phytoplankton bloom ... the match or mismatch with the annual peak in primary production may be critical for the Arctic food webs in their current forms." For those struck by the large summer blooms in the Barents Sea, these are attributed to coccolithophores e.g. exploited upper trophic level species. The "shift towards smaller" is an interesting. Unrelated, so happens that a study was made of herring recovery after fishing constraints were enforced in the greater North Sea region after dramatic overfishing depletion. The populations grew, but the herring stayed smaller, to escape the mazes of the nets so is one theory... evolution in action. The knock on consequence on those that feed on herring, not read up on that but doubtlessly there is. Chris Reynolds: "My interpretation of this change is that previously there was less change of thickness during the summer because reduction in volume was largely accounted for by reduction in area." Hi Chris, I'm still trying to get my head around what you are saying here, or perhaps I'm trying to turn it into a headline. Are you saying that prior to 2010 there was older, thicker ice that had to be melted before the thin new (quick melting) ice could be gotten at? I'm buying into your theory on the structure of the 2010 event, though I think in a longer term analysis it is the increase in sea water temps which is more significant. In essence 2010 was influenced by a normal peaking El-Nino in December 2009. Clouding up the Arctic, but this El-Nino vanished quickly thereafter morphing to La-Nina by spring. It was a perfect combination for melting already weakened Arctic Ocean ice, which has never recovered and since then has caused its own weather pattern shifts. Much more independent of ENSO, but characterized by thinner ice build up during the long night ever since. Its the closest thing to a tipping point readily visible to all. Since then, during the long night, cyclones from the South have penetrated fortress winter right when it usually influenced winter to the southwards, this is why winter appeared stronger over the continents. But that was an illusion, the heat usually bounced back by fortress winter over somewhere over a continent penetrated the deep North, the High Arctic. Winter weather itself is under assault by sun stored heat over the naked oceans once covered by ice at latitudes 65 To 80 North. This process is in progress and can be readily exacerbated by normal ENSO influences, a further weakening of the ice is taking place right now if El-Nino conditions persist well onto January, the ice buildup will be even lesser, if El-Nino changes to La-Nina this coming spring , exactly like 2010, expect a further thinning of ice and a wide open North Pole accessible by any sea worthy ship not needing icebreakers. If there hasn't been any dramatic change in the environment of the Arctic (temperature of ocean, air, weather patterns etc.) between 2009 and 2010, then the dramatic change in the behavior of the MYI must be due to a qualitative difference in the ice itself. I watched Barber(sic) lecture last night as he described the icebreaker's ability to cut easily through 9 meter ice (it split and rolled over quickly). Could all of the multiyear ice have become rotten due to the prolonged shift that it has been exposed to? Spiral version still in progress! It is quite clear that the canary stopped singing in 2007 then fell off its perch in 2012. "I watched Barber(sic) lecture last night as he described the icebreaker's ability to cut easily through 9 meter ice (it split and rolled over quickly)." The takeaway from that statement is that not only quantity of ice is important (as PIOMAS presents), but quality of ice is at least as important. As Barber showed, for some operational purposes, the Arctic may already be 'ice-free'. Yes, ice still occupies space and shows up on the elecro-optical sensors, but for many practical purposes, it might as well not be there. In previous posts, I discussed 'cherry-picking' of data, and the feedback was very negative. Well, in my estimation, slavishly focusing on the ice volume trajectory without examining quality at the same time is a 'poster boy' for cherry-picking. Obviously, it is done on this blog because it's easy to measure, like the old parable about looking for the keys under the lamp-post. The ice is dead; accept it! Whether it takes a year for the corpse to decay from the sensors or ten years is not the issue. What we need now is an expert pathologist to examine its demise over the past decade or two, and describe all the responsible mechanisms, and how they interacted, to bring about the demise. Isn't this the same thing that Dosbat (I think) was referring to in March as the loss of the "roof" of thick ice during the summer with the moving of the thickness maximum from August to June? I remember trying very hard to make sense of that at the time, and it is now clear that the mechanism (I think) being proposed in the post (i.e. the lack of MYI in the CAB making the ice incapable of resisting thinning during the early season after 2009) accounts for the pattern very well. The reduction in summer thickness requires that the CAB ice still be able to resist outright ablation during the early season to lower the thickness numbers to the observed levels after the late May maximum. Should we be expecting this pattern to reverse once the final decline begins? It would seem to me that if the (now mainly FYI) CAB ice becomes thinned to the point that it ablates as fast as it thins, we will see the thickness number in June pick up (momentarily). Dep't of Esoterica. Something I didn't expect to happen this year: CT SIA is now lower than the CT SIA 79-08 anomaly. There is another cog in the wheel that may be influencing ice thickness formation. This paper by Jennifer Francis march 2012 describes a profound effect of less fresh water melt on the temperature gradient under the ice. Has this been included in your deliberations on winter formation of ice thickness? Perhaps a lack of sufficient data on winter thermoclines and current patterns makes it difficult to determine but this deserves examination. ... which makes it as the noted less than 50% of base line. We need a cheat sheet for regular special and icoteric numbers. Something that can be clicked on in the side bar. Who volunteers? Where is there a map of PIOMAS ice thickness alluded to? I've been watching the same thing and, now that we're only a couple of days out, the prediction seems more likely to bear out. They predict very fast drift velocities which implies that the pack, while dense, remains loose. I'm sorry if I've missed it previously but this did come up re. the GAC. Does anyone have good references on floe-level effects of churn? the issue of mixing in the water column arises again... what do we know about temperatures vs. depth at this time of year? The parallel of Area and thickness is pure coincidental.. just worked that way from the dual Y axis scaling. From 2.40 meters annual average in 1979 to 1.51 meters [so far, thru Aug.25] in 2012. Thanks for pointing out the error - now fixed. As you'll see from my second blog post on the causes of the 2010 loss I'm saying that it was a combination; warm anomalies through the winter due to WACC followed by warm anomalies of the CAA in the spring. It is these latter anomalies that area associated with the greatest loss of thin ice concentrated off the CAA where the thick ice is - thus presenting an explanation for the preferential loss of thick ice. That's a big early season volume drop. FWIW it was that change in the anomalies that first made me ask the question - what has happened in 2010. We really need 2012's data, but it seems the update is done once a year so we'll need to wait for that to compare - I'll be posting about those images, how they were made, and how to use the gridded PIOMAS data in due course. However, day 140 to 170 corresponds to mid May to mid June, the intermonth plots clearly show that from April to May there's widspread net thickening, but from May to June and onwards the thinning starts. These clearly show that 2009 is the end of one period, and 2010 the start of a new period. As I note in my blog post, the sharp drops in early June (after day 160) are common to 2007, and 2010-2012. In 2007 these were caused by warm water influx due to a strong early +ve Arctic dipole advecting Pacific water through Bering. This doesn't seem to be the case in 2010-2012. I think that net thinner ice means melting is staring earlier - as seen in the volume anomalies, and causing thinner ice which is enhancing the rate at which a given melt exposes open water - so affecting the CT area anomalies as seen. There may be a role for warm water advection in 2010-2012, or just an initiating role in 2010. But I don't have evidence for this at present. Given that the models show the RILEs are associated with preceding pulses of warm water, and the clear role for this in 2007, it's certainly a possibility worth pursuing. However the volume loss is from PIOMAS, and PIOMAS is driven by NCEP/NCAR 'weather' data, so this must be an atmospherically driven warm water influx, not due to some deeper change of currents, which I presume PIOMAS wouldn't necessarily reproduce. Regarding ocean heat fluxes - see my closing paragraph to Iceman, above. When we're talking about calculated thickness, what NEVEN calls PICT, we have to be mindful of the definition - Thickness = Volume / Area. Now if volume goes down, but area is specified, then the remaining variable thickness must be going down to account for the drop in volume. That's what I'm getting at in the part you quote. So before 2010 changes in volume were largely accounted for by the change in area, but after 2007 there had to be more thinning to balance the equation. That's a key question and one I'm still wrestling with. I don't think it makes sense to envision ice waiting in the queue for heat flux because there is still thick ice melting. But it makes sense to ask how thickness is reported both in the whole Arctic average, as in calculated thickness (over the whole pack), or at the grid box level. I've had an idea and I'll get back to you on this - maybe as a blog post. Yes the loss of the roof followed on from my shock at what the volume anomalies showed after 2010, see reply to Iceman for link to graph. My ideas have been forming as I've blogged and new information has come to hand. Sorry if I'm sometimes not as clear as people may like - when I am it's becaused I'm not as certain about what's going on as I'd like. I'm not convinced that there will be a June pick up, I think it's downhill from here, and the more I think about it the more I'm drawn to Wadham's claim that the end will be fast. I'll think about what you have to say, but have another idea about the thickness drop - one that's so simple I can't believe it didn't occur to me months ago. Sorry didn't see anything about ocean warming in that article, or in the linked article "Arctic Tipping Point: A North Pole Without Ice.". I've read rather a lot of Dr Francis's work and can't recall here writing about ocean heat fluxes. Sure you have the right link? I'll blog on what all that's about in due course, in the mean time there's a readme with a quick explantion. It's all done in Excel using macros, again I'll blog on that. Thanks for the work on your blog. I disagree that ENSO has a role, these come and go but don't have the impact that of 2010. What does stand out is the priming of the WACC pattern and the spring warm anomaly over the CAA. If we have a repeat of that pattern this winter, or a repeat of 2007 and the polar express then I'll be with you on open water at the pole. As things stand I merely expect a fresh record next year, below this year's record. "The ice is dead; accept it!" Doesn't everyone know that already? Is today the first day that CT ice area is less than the anomaly or did it happen back in August during the storm? I thought I was reading it wrong at first. Sorry, answered above by Dave et al. Been watching the arctic ice on and off last few weeks while keeping both feet in the tropics... but thought I'd add my 2 cents since there is a nice lull in meaningful TC activity. After 25 yrs of watching ice meelts, it really should not have been that surprising to have seen this seasons' monster melt. But it was, to many of us. With last winter's extreme cold across the high arctic (especially in the western hemisphere and in particular, across Alaska and northern Canada) we saw total aerial ice extent reach levels not seen in almost a decade, with all-time record breaking extents in the Bering Sea. The primary storm track in the fall & early winter also put down an early and heavy snow cover from Alaska to northern Canada. Even spring breakup and arctic ice melt season began somewhat later than we've seen in recent years. When asked last April if I thought we'd break and extent record by SEP, I said 'probably not'(I actually gave the classic 'WX guy' reponse of a '50/50 chance'). But by late June and early July, it became obvious that melt season was proceeding at a rapid pace, and it continued with and without the overly emphasized 'dipole pattern'. Indeed, we had a highly vaiable weather pattern throughout the summer; and this was not thought to be conducive to a rapid melt - let alone a rcord melt rate. I id fully expect the NWP to open up again this year because the early and deep snow cover acted as a 'blanket' over the thickening winter ice there, and it stood to reason the actual ice thickness by spring was not any greater than it was in recent years. The almost overnight vanishing of the ice across the NWP waterways seems to have confirmed this reasoning. The loss of multi-year ice since 2007 has been well documented, and as we've seen with the ice sheet over Greenland, as older ice becomes exposed each year, the net albedo of the ice decreases, and with all things being equal, will help accellerate the melt rate. Back in 2007, I openmly questioned wheyther we had, indeed, reached the 'tipping point' in cie loss that would allow for an ice free arctic much sooner than earlier projections of 2040-2050. Initially, I thought 2020-2025 seemed about right, but after observing the 2008 and 2009 extents, thjough 2030 was probablky most likely. However, with the new, higher resolution thickness and volume data now being readily available, and the remarkable melt of this summer - I'm inclined to believe that ice free summers will become the new norm by 2020. And while the 'dipole' pattern, summer storms and other 'indicators' (known and yet to be discerned) will play a role in any given seasons' ice loss - IMHO it's the loss of multi-year ice that will be the primary force driving future season's ice loss and the date when we experince the first summer without arctic ice since modern man first set his eyes on the arctic ocean, and when the Polar Bear first walked away from it's Brown Bear cousin about 100,000 years ago. Chris. Sorry for that, here is the reference. http://www.cbc.ca/news/canada/story/2011/06/28/arctic-ice-melting.html Is this considered in your evaluations? r w Langford provided http://www.cbc.ca/news/canada/story/2011/06/28/arctic-ice-melting.html . Very interesting. If they are right, then it would seem we have yet another positive feedback. Melting first year ice leads to greater churning of the surface water bringing up more warm water against the ice. It's on those findings, that FYI melt water sinks to 200m allowing the remaining ice to sit in a pool of warmer water, that I think the 2010 anomaly is based. 2009 left a larger than recent amount of FYI ready for spring melt. When it melted and the melt water sank to 200m it allowed far more bottom melt than in the past. This has repeated each year since, and 2011, which again sported expansive FYI set us up for what we're experiencing now. If this is true, and old MYI is now escaping through the Canadian Archipelago, next year, and any year going forward should exhibit the same behavior on steroids. Jim. I agree with your earlier comment about a significant influence by water temperature. There appears to be an abundance of satellite data that is incorporated into much of the discussion on this blog. Currents, both vertical and horizontal play a major role in moving large amounts of heat around. Small water temperature changes will cause a lot of melt if currents are fast. Vertical water movements are studied in a lot less detail than surface air temperatures but they may be a trojan horse in sea ice decline. I scrolled back to July, but didn't notice an "Open Thread", so I'm posting here. I like this site, I really do. I think Neven is doing a wonderful job. But the commentators, not so much. Science requires clear concise communication, ambiguity is anathema. Part of this is accomplished with common reference and language. So how about it people? Recently I've seen stuff like "Black Dragon" events, or was it "Golden King" or some other nonsense. Today I find, "CT SIA sits at 49.54% of climate level for Sep 2, 2012"
What the hell is "climate level"? Given that CT are reporting for 3rd Sept, should I believe that the area has reduced by half overnight? How about less excitement, and a few more deep calming breaths? You'll find my suggestion about what might be going on with the loss of summer calculated thickness (PICT) here. On the spreadsheet I use I've calculated the average sea ice area (Cryosphere Today) from 1980 to 1999 for each day of the year. The others are just using a different baseline period. I stick with mine because it's what I've used since I was still a climate change sceptic. I just meant to say in that post that the reduced summer thickness that we've had recently might be a product of being in an intermediate/penultimate state - the MYI is gone, but there's still enough FYI to prevent the breaching of the final threshold - the melting out of a large enough area early enough in the season so that the reduced albedo/increased energy absorption dynamic is sufficiently potentiated to take out ALL of the ice before the insolation rates close down lat in the season. The question is - when will this happen? I was suggesting (or meant to suggest) in my post above that one of the first signs in that year might be the wipeout of a relatively large area of thin ice (exceeding the feedback threshold area defined above). Since the remaining ice would be very briny, slushy and very recently formed FYI , it might not offer much resistance to the feedback mechanism (because of the prolonged delay in freeze-up due to the need to radiate huge quantities of heat from last years season - think Kara Sea, February 2012). Remember, ice free AREA, not ice volume, will be the key factor in determining the strength of the feedback mechanism, especially without any MYI capable of putting up serious resistance. The critical state of affairs heralding imminent collapse might therefore be most easily identified by a transient INCREASE in mean ice thickness that would be accompanied/followed by cratering SIA and SIV numbers ending in melt out. Thanks for that, yes, it's old news, I've a report from the Caitlin team somewhere on my laptop. I'm not saying it hasn't a role, but let's not jump to assigning everything to ocean melt. Winter 2009/10 was anomlously warm in the Arctic, there was evidence of failure for ice to thicken. Then in Spring, right where the area anomalies in thickness dropped through the floor (off the CAA), there was a widespread and massive (+6degC for monthly average*) warm anomaly. *For monthly average that's big, it'll have meant higher for periods within that month. Like I say - the ocean has a role, but I really think the atmosphere looks more like the culprit, and may be the culprit for the failure of any recovery from 2010, e.g. See these temperature anomaly plots for February to April. Black Swan: an anomaly, followed by a return to the old normal. Dragon King: may look like an anomaly at first, but is a paradigm change, a switch to a new normal. Here are two warning signs I'd suggest watching for an impending crash - I expect action from these next year. An early season increase in volume loss. Then, watch out for the early june crash in CT area anomalies. Followed by persistence of low anomalies. Here are tropospheric anomaly plots of air temperature, cross section through atmosphere from N Pole to 70 deg N lattitude. Check out the files "Tropo cross section Feb April XXXX" where XXXX is year. The post 2010 anomalies are concentrated in the lower troposphere, so I'm not sure that what we're seeing isn't warming from the ocean due to thin ice and leads, rather than the cause of ice loss. So the early season volume loss in PIOMAS may not be caused by the warm surface temperature anomalies I show in my post to RW Langford. The temperatures may be a result of the ice loss. CT tale of the tape some red line is descending at the top of the graph. I know it's inconsequential but it's bugging me what it is. I thought it might be the arctic basin anomaly bleeding through but it doesn't quite fit. So what Lodger actually meant was that the 3rd Sept 2012 SIA has a negative anomaly of 49.54% in comparison with the 2nd Sept Daily SIA averages based on the CR (Chris R) dataset of Cryosphere Today values. Or that it is 53.25% of the '80 -'99 daily baseline value of CT SIA. k eotw: That red line is the actual Arctic ice area as it drops below 3. "So what Lodger actually meant was that the 3rd Sept 2012 SIA has a negative anomaly of 49.54% in comparison with the 2nd Sept Daily SIA averages based on the CR (Chris R) dataset of Cryosphere Today values. Or that it is 53.25% of the '80 -'99 daily baseline value of CT SIA." No I think Lodger is working off the CT area index file's baseline. That's date / baseline average / actual value / extent. I think. From the first numbers after the date 49% looks about the right ballpark. My 53% is based on my own baseline as explained. "The temperatures may be a result of the ice loss." Exactly my point - the decreased albedo due to early season ice loss when the sun is high is going to be the ultimate trigger, causing greatly increased ocean heating that drives the cycle. This provides the ultimate threshold for same-season melt out. The preceding domino is the amount of heat left in the ocean after the previous season, which makes reaching the threshold possible either by melting directly or by inhibiting re-freezing. It is actually the sum of two "dominoes" - the failure of the ocean to dump all of the previous season's heat plus the current heating due to increased absorption caused by albedo loss. Add in the increased convection caused by the melting of briny ice which brings up warmer water capable of melting more ice, and you have a classic case of synergy - so much positive feedback going on that it is hard to say what causes what. Forgot to mention in the last post that your suggestions of SIA low anomalies and volume loss in June as prospective diagnostics look pretty good. I can see how this might be a bit more robust than my suggestion of a thickness rebound (caused by a greater area loss than volume loss) in a real world where elegant mechanisms rarely function conspicuously and alone. However, I still like the idea that area should go down MORE first (leading to the aforementioned "death rattle" thickness increase), since it is the more important trigger of an albedo loss driven mechanism. It is kind of like debating the relative merits of boiling oil and melted lead at one's own execution (Terry will know the reference). Chris Reynolds: "You'll find my suggestion about what might be going on with the loss of summer calculated thickness (PICT) here. I'm chewing on it. Not ready to buy it, but it seems sort of right (maybe). Hi, I'm a new poster to here. Great blog and hugely informative discussion, thanks to all of you. Maybe comparing the time-shift in downtrends will yield some insight. Following the big drop in ice thickness in 2007, the downslope in volume anomaly has been earlier and/or steeper than before. .. because that's just what I've been doing. My aim was to see what eventual minimum to expect from the PIOMAS volume measure this year. Since day 238 is the last available datapoint for us at the moment, I looked at how previous years had compared, calculating the ratio of PIOMAS minimum to day 238 value, and also comparing the minimum against a 5-day mean ending on day 238 in case of one-off anomalous values. From 1979 to 2007 (inclusive) the eventual minimum, whenever it occurs, averages 95% of the mean of days 234 to 238. The variation is small (std. dev. of 0.016) in these years. After that, for the last four years, the ratio plunges and gets more erratic, averaging 89% which is significantly outside the range of variation seen in 1979-2007. As to the timing, I checked the date of the minimum over the whole series. Because there is sometimes some double-dipping and because the timing of the minimum could be sensitive to a single outlier I used a ten-day running mean. I found that the date of the minimum appears not to trend and almost always occurs between days 255 and 270. I'm somewhat surprised by the timing result, but thought the abrupt change in the behaviour of the last few days of the downward slope was interesting in the light of discussions on this site about the clear changes in the shape of the melt curve since 2007. What minimum value does anyone here think we'll see for PIOMAS volume this season? The new EC composite is up, if anyone cares. I just posted the (mostly) declouded version at AmWx (scroll down at the link). It's actually not as bad as I feared - it does look as if bottom is near. But there are a ridiculous number of holes in ALL of the remaining ice, which can't be good. Chris and Dabize . Has anyone calculated bottom melt rates for FYI and MYI by month and by region? This is the type of information that can tell the relative importance of each domino. It may also reflect the lack of hard data and analysis on bottom melt. r w Langford: Yes they have. Kawaguchi et al 2012, Polar Science 6:39: "Anomalous sea-ice reduction in the Eurasian Basin of the Arctic Ocean during summer 2010"
During the summer of 2010 ice concentration in the Eurasian Basin, Arctic Ocean was unusually low. This study examines the sea-ice reduction in the Eurasian Basin using ice-based autonomous buoy systems that collect temperature and salinity of seawater under the ice along the course of buoy drift. An array of GPS drifters was deployed with 10 miles radius around an ice-based profiler, enabling the quantitative discussion for mechanical ice divergence/convergence and its contribution to the sea-ice reduction. Oceanic heat fluxes to the ice estimated using buoy motion and mixed-layer (ML) temperature suggest significant spatial difference between fluxes under first-year and multi-year ice. In the former, the ML temperature reached 0.6 K above freezing temperature, providing >60–70 W m−2 of heat flux to the overlying ice, equivalent to about 1.5 m of ice melt over three months. In contrast, the multiyear ice region indicates nearly 40 W m−2 at most and cumulatively produced 0.8 m ice melt. The ice concentration was found to be reduced in association with an extensive low pressure system that persisted over the central Eurasian Basin. SSM/I indicates that ice concentration was reduced by 30–40% while the low pressure persisted. The low ice concentration persisted for 30 days even after the low dissipated. It appears that the wind-forced ice divergence led to enhanced absorption of incident solar energy in the expanded areas of open water and thus to increased ice melt. (I should mention that I am just a know nothing amateur on all things here as would be any citizen; only reading this blog for a few years; and convincd that if people on a blog can think of something then the scientists for sure will have thought of it too, so all I can do is try to hunt their writings .. which often yields more than one can understand). who state that "over the course of the summer season, sufficient energy enters the upper ocean through open water to wholly support the observed [bottom melt]." My comment above was not meant to curtail conversation. It was merely aimed at encouraging more precise conversation/observation. So ... "I should mention that I am just a know nothing amateur on all things here as would be any citizen;" ... is not necessary. Most of us are amateurs. With regard to Enno's reference, I would suggest that the relevant criteria is the insulating properties of ice and the resulting heat flow from the different levels of insulation. Oh, and the fact that MYI is likely to be deeper into (furthest from the edge) of the ice pack. Enno, why wouldn't it be both? Just because "over the course of the summer season, sufficient energy enters the upper ocean through open water to wholly support the observed [bottom melt]. ", this doesn't mean that all that energy entering the upper ocean has to go into melting ice. It can go elsewhere like warming atmosphere or out to space leaving room for a role for heat from deeper Atlantic water to melt ice. I assume in the abstract you quoted talk of heat fluxes is about heat from deeper Atlantic? water but once they change to talking about ice concentration they switch to talking about solar insolation absorbtion. I assume the paper will have considered Ekman pumping (and consequent mixing) which will be another effect of the low pressure. That would me more about heat from deep water. I certainly agree with your "the scientists for sure will have thought of it too". "More significant ice loss may be coming soon. The 090612 NRLSCC forecast ice motion depicts a strong low over the CAB, driving ice through the Fram, then churning into the CAB 090712 and dissipating 090812." Looking at the winds around that low, couldn't this also wipe out the thin ice that is extending into the Laptev Sea? Hi Chris, swell blog by the way! "I disagree that ENSO has a role, these come and go but don't have the impact that of 2010. What does stand out is the priming of the WACC pattern and the spring warm anomaly over the CAA." I really liked the PIOMAS volume graph presentation, I always said ENSO is part of a world wide system of systems, of which I never thought much of it until I realized that cloud seeds are extremely important. From thinner ice, the Arctic is now influencing all other NH systems by its own lack of cold air gravitas, displacing, dislocating normal patterns and in turn incapable of repulsing warm cyclone intrusions which is an important feedback. I have to say that I do not think that we have yet experienced the kinds of feedbacks that seem to be discussed here, apart from temperature amplification due to albedo changes. I have said this before, but a simple model of ice melt with linearly increasing temperatures produces an exponential decline in ice volume. We are observing both linearly increasing temperatures and an exponential decline in volume. No other parameters or feedbacks are needed to model this. Further, the time period over which all this has occurred is very, very short. For many feedback processes, there simply has not been enough time for them to kick in in a significant way. I understand that the simple model is likely to be wrong in important respects. But it seems to be working over the short time period that we have observed. And I keep saying 'exponential' when I mean 'quadratic'. Sigh. Back to the original blog: If you look at the reports of ice conditions in the Arctic 08-09 such as Dr. David Barber, what PIOMAS found in 10 is more like a house collapsing from termite infestation. Looking at May 10 events will not help at all. Somehow we have to turn back the clock and figure out when the ice started to rot. Only then can we begin to hope understand what caused the rot. The collapse of the volume in '10 was a result of catastrophic ice rot of the MYI. That did not happen over nite. Did it start with the bad summer of '07? Or did '07 just make worse what was already happening? Dr. Barber talked about the finding that CO2 moved freely through the ice. Could that have set off a chain reaction that changed the chemistry in the ice creating the rot? Maybe the fresh water/ salt water/ hot/ cold/ layers were not as defined and stable as once thought, and that caused the rot. For too long we have taken the attitude that the Arctic was a stable isolated system, and because of that have made a lot of presumptions as to how things work. We understand the workings of the oceans surface currents, but are there similar currents below those that we do not know about that actually go into the Arctic and impact the Arctic that way.Just remember, we know and understand far more about space than the oceans. To be repetitive, the collapse of '10 was because of rot and that rot took years to occur. Until we understand that we will never really understand what is going on in the Arctic now nor the impacts in the future. Excellent post Neven, and thanks to Chris for his analysis and charts. My understanding of 'the rot' is that it was caused by ever increasing temperatures in the Arctic. I do not think that the collapse was anything special - one year, there was going to be a dive in volume, simply because of variables around the trend - just as for a short period volume appeared relatively stable, even though there was a long-term and rapid decline in progress. We are not really going to learn too much more than 'the more heat you push at ice, the faster it melts'. There may be things to learn about how that heat was distributed, but the basic reason for why we are in the state we are now is that heat melts ice. Now, it could be that the reason many models did not pick up on the rapid decline is that scientists were trying to take into account all kinds of potential negative and positive feedbacks, feedbacks that in the real world simply have not had time to kick in. While you do need to pay close attention to the trees a lot of the time, sometimes the forest is worth looking at, too. Seke and Timothy: The algae bloom you are referring to, if the one above Scandinavia is likely mostly coccolithophores. Or rather, their dead skeletons. Coccolithophores are a good example of how life interacts with the physical world and changes it. Coccolithophores can tolerate very high levels of sunlight. They are not photoinhibited like most other phytoplankton (sunlight-using types). It would seem that the coccolithophores, being very reflective organisms, scatter incoming sunlight so that the light gets trapped and intensified within the bloom area, thus inhibiting other types of photosynthetic algae (and possibly zapping viruses/predatory zooplankton/bacteria, etc…?) Their reflecting ability lives on after they die, as their shells still stay suspended until they disperse/dissolve. Photosynthetic plankton (phytoplankton) produce oxygen more than they consume it (they consume O2 during darkness). Non-photosynthetic, heterotrophic plankton consume oxygen and produce none. If nutrients are loaded into the water, a bloom of non-photosynthetic plankton (and other non-photosynthetic microbes) will occur. If the bloom is large enough, far enough from light sources, and the rate of water exchange is low enough, the bloom will use all the oxygen without producing enough to replace that used - and then die from lack of oxygen. That’s a dead zone in open water. ...As far as the nutrient load in the Arctic, this is a very interesting issue, because with all the erosion from the tundra, lots of extra material should be going into those waters now. This material, taken up and fixed by plankton and other organisms, can essentially stay suspended in the water column. As one organism dies and drifts downward, other consume it and potentially move back up, keeping things “afloat.” Again, this is also rather complicated, as currents and plankton sinking rates will determine the net flux of nutrients to the bottom. The uncertainties therein are a primary reason we haven’t seeded the oceans with iron to try and sequester carbon through the sinking of phytoplankton carbonate-type shells. Unable to make up her mind ever since she got baptized by fame. Pondering the Arctic sea ice, a couple of observations. First, there is a disparity between winter and summer "melts". The winter ice maximum develops in northern Atlantic and Pacific waters, not within the Arctic Ocean proper which is frozen over all winter. Different and independent environments altogether as to salinity, stratification and sea currents. There is a decline in extent winter ice, but it is small and appears to reflect the general warming trend. The summer minimum is drastically more pronounced. It happens in the specific circumstances of the Arctic Ocean. It also repeats, so some form of memory must be involved. A clear "mode change" in the process has appeared. Even a short impulse like the one seen in 2007 allows the winds to break the stratification. Repairing the low salinity layer is a slow process. This may be the observed memory fuction. Freezing is of course a function of both water salinity and temperature. In my view, stored heat can not alone provide the memory function we observe over the past 6 years. Maps of long term surface salinity change, anyone? k eotw. That 'funny' red line on CT's tale of the tape graph? That's just the actual area graph showing up for the first time. No-one ever expected area to go below 3million for both lines to appear on the same display the way they do on the individual sea/basin/bay graphs. Just one more depressing little side-note to add to the collection. "The uncertainties therein are a primary reason we haven’t seeded the oceans with iron to try and sequester carbon..."
I had a short discussion with commenters Wayne Kernochan, Phil263, and Kevin McKinney in Nov 2010 about seeding the ocean with iron as a carbon sequestration scheme. So obviously this is a topic I'm interested in. Is this something your lab or perhaps USACE is studying? Do you know of any current research on this topic? @LRC: "Somehow we have to turn back the clock and figure out when the ice started to rot. Only then can we begin to hope understand what caused the rot." To me, there are two changes to consider here. The change in across-the-board thickness and the change in annual shape of that curve. The change in across the board thickness has been happening for "many" years. By 2006, thickness had fallen from the 1979-99 average by a fairly uniform 40 cm (a bit more in summer a bit less in winter) - about 2.5 std devs below the 79-99 average - which is a fairly unremarkable example of "the more heat you push at ice, the faster it melts" as Evilreductionist puts it. But to that point, the annual shape had only changed a little. The peak was occurring a little earlier (or August / September had lost a little more than other months), but it was not greatly different from the 20 year trend. I did a bit of checking on the CT anomaly ticker. 2007 to 2012 at this date. 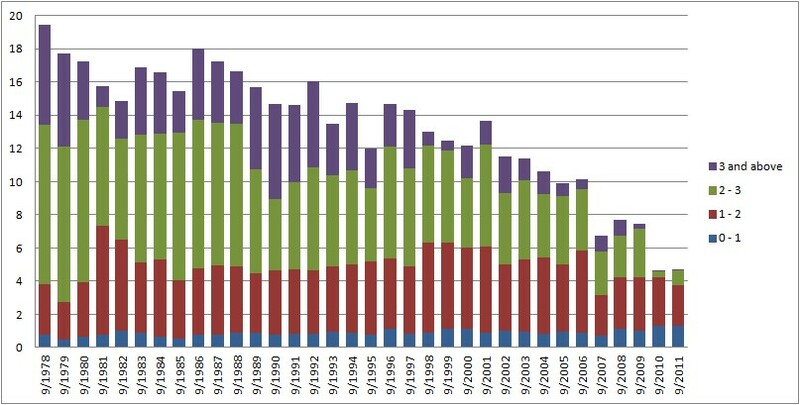 I took the ticker chopped off from 2007 and then put a line on the 2012 chart. Copying the line to 2010 nets around 1.8M anomaly. They're going to have to make the anomaly chart bigger, it's certainly going to blow 3M by the end of October. What I'm wondering is about state changes. Today we see volume reductions based upon the current state, still with some sort of ice cap. I'm wondering if the change, when we do see an ice free arctic, will not change again. It may be that winter and spring volumes are not going to decline in a linear way, or even an exponential way. Just surmise, I have no intention of being surprised if we see 2/3 months ice free in 2020 and then it stays that way for another 10 years until additional feedbacks kick in. OOOps. meant copying the line to 2007, not 2010. Posting with a cold... Not good news. "Now, it could be that the reason many models did not pick up on the rapid decline is that scientists were trying to take into account all kinds of potential negative and positive feedbacks, feedbacks that in the real world simply have not had time to kick in." You have made this point multiple times. What is the evidentiary basis for such a statement? Remember, these are nonlinear dynamical systems. There does not need to be a large change in the boundary/initial conditions to effect a large change in the outcome/solution. There have been large increases in the methane released in the Arctic. One of the recent Russian expeditions talked about observing methane plumes on large spatial scales, orders of magnitude larger than observed only a few years earlier. Cyclones have increased in strength, due to more open water and more heat to drive them. There are many other examples. I recently read a review of Arctic models published in March. Even the best models don't appear to incorporate methane release and other feedbacks, and if they are regional, don't incorporate feedbacks from deforestation, wildfire, and other phenomena. Some of the better models predict 'ice-free' late Summer conditions in perhaps three years, with substantial uncertainty. If feedbacks were incorporated, they would push the results in only one direction. So, the most conservative results are being generated by the models. Additionally, they are not taking into account, nor predicting, the quality of the ice. For any functional purpose (navigation, tourism, defense, climate stabilization, etc), the ice may already be gone. I think a better model than one that ignores feedbacks is that of a house. The center of the roof is flat, and the sides are sloped with slightly increased slope as the edge is approached. In the 70s and 80s, we predicted what would happen when walking away from the center based on what we measured in the center. Business as usual. In the 90s and early 00s, we predicted what would happen when walking away from the center based on what we measured on the center and beginning of the sloped part. Now, we are predicting what will happen when walking away from the sloped part based on what we measured for the whole of the sloped part. Without the feedbacks, we will see more sloped part, perhaps with slightly increased slope. With feedbacks, it will be obvious that we have stepped over the edge of the roof. For me area/extent is becoming clear as a sideshow, the main player is volume loss. 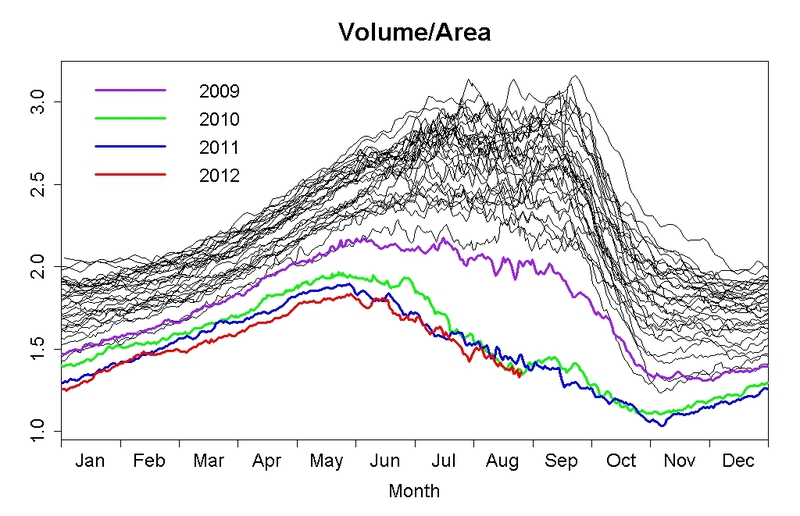 Volume loss carries the signal of ice loss over winter in a way that area/extent doesn't. This is secondary result of the Notz & Marotzke paper that found no evidence for self-acceleration (SA) in the extent series - there is no evidence of SA there, but the same arguments fail to reject SA when applied to loss of volume. In my first blog post I pointed out that since 2002, excepting 2008 (rebound from 2007), every year has shown year on year drops in volume. So it seems to me it's reasonable to suspect SA plays a role here. Other research shows the Arctic Dipole became the dominant mode in synoptic scale activity in the Arctic after 2003, should we suspect the AD? It will play a role, but from what I've seen I dont think it has played a strong role every year. So I still view the period after 2002 to be a likely candidate for SA driven volume loss. It is this volume loss that drives the area/extent recession. As the ice gets thinner the same amount of melt will expose more water, this is what open water formation efficiency is all about. So it is the loss of volume that's the driver. I think this loss is going to accelerate, so unless you're referring to losing peripheral thinner ice, and that biassing the average thickness up, I don't see why thickness should go up at all. That said, I am tired and probably need to think about it after a night off. Thanks for that abstract, I've not seen that paper yet. What interests me is the the FYI region had greater bottom melt heat fluxes than the MYI region. I'll have to see if I can track that paper down. You may be right, perhaps the warm period of Spring was due to open skies under La Nina influence. NCEP/NCAR doesn't suggest a pressure pattern that implies open skies. That might explain the lower tropospheric warming of 2010. So do you think ENSO could account for the Spring warming, rather than the spring warming being due to ice thickness? Check out the plots in this folder: Check out the files "Tropo cross section Feb April XXXX" where XXXX is year. Let me know what you think. If there is an alternate explanation for the Spring volume anomalies then I want to know. I had assumed that weather coudln't account for the volume anomalies or calculated thickness change because they're regular patterns that seem more likely to be due to a change in the ice. If this isn't the case I want to be convinced of an alternate explanation - it's preferable to what I'm seeing at present. Sorry, no Jim, you don't seem to get it. Let me split things down. 1) The volume loss in 2010. 2) The change in seasonal cycle of PICT (calculated thickness) that this caused. My explanation for 1 is given in the two posts Neven linked to in the main article. The new blog post I linked to was my tentative explanation for observation 2. 1. Area and extend becomes irrelevant, and will only have the interest of gamblers and record samplers. 2. Volume will soon tell us when the show is over! Hi Chris, do you have a sudden change in the ratio of MYI to FYI which corresponds to the sudden change in the shape of the PICT? "Volume will soon tell us when the show is over!" Incomplete metric! As I stated above: "Additionally, they are not taking into account, nor predicting, the quality of the ice. For any functional purpose (navigation, tourism, defense, climate stabilization, etc), the ice may already be gone." The volume left, same as +/- 1.2 meter in average thickness is more or less rotten all over the place, even some +5 meter pieces left here and there can be cut by a non- arctic icebreaker from PANYNJ! The differences between the maxima and minima are key to understanding what is going on, in my opinion. I see most of the explanation as intrinsic to the ice itself, although changes in statification and heat content of the ocean plays a key role. What I see is that the ice has been undergoing a transition from a formerly multi-year ice (MYI) pack to a new first year ice (FYI) pack. The loss of MYI is due to its long time constant, whereas FYI can regrow in as little as one winter, it takes years for ice to thicken and age (i.e. Bitz & Roe). In particular the summer recession in the Pacific sector (Beaufort/Chucki/East Siberian seas) means that the Beaufort gyre flywheel has broken down, this is because whereas once the BG flywheel circulated and aged ice, integrating weather impacts in ice and smoothing the net response, now the gyre sends thick old ice to destruction in the summer recession in the Pacific sector. Indeed the Woods Hole Institute state that the BG flywheel operates in 'healthy' sea ice. Once the ice pack gets to a mainly FYI state weather events have more impact (e.g. 2007, 2010, 2012), and these impacts are having a lasting impact on the continual downward progression of volume. I had thought we'd have decades with a mainly FYI pack. Now I suspect there is no equilibrium state for such a pack and that we are in the early stages of a massive rapid ice loss event (RILE), one that may bring about ice free conditions well before 2020. With regards salinity. I have tried to use Mercator Ocean's model ouput, however there are repeated changes in that model, at some of the changes discontinuities are evident. It gives surface salinity and salinity of the first 10 levels, but I haven't had the time to look at that data yet, I've only used thickness fields. This is compounded by that data only running to 2004 (IIRC). Over the 20th and 21st centuries, this heat transport exhibits a gradual upward trend overlaid by periods of rapid increase (Figure 3a). These rapid "pulse-like" events lead changes in the sea ice by 1–2 years, which is evident from the timeseries of detrended heat transport and detrended ice thickness (Figure 3b). Ok Chris. It's the best (only) explanation I've seen for the sudden change in PICT. Looks like it was specifically 2nd year ice that ran out. "unless you're referring to losing peripheral thinner ice, and that biassing the average thickness up, I don't see why thickness should go up at all"
Thats exactly what I'm referring to......I guess I just wasn't sufficiently clear. Maybe I should have said "PICT" value instead of "thickness"
I don't think it's specifically second year ice that's gone. There will be older ice in the pack. Each season as the minimum isn't zero, some ice is surviving, some of this will then survive yet another season, as it won't all be exited through Fram Strait or sent to melt in Beaufort, Chucki, and off siberia the next season. Look at the ages and what's happening to the amounts. 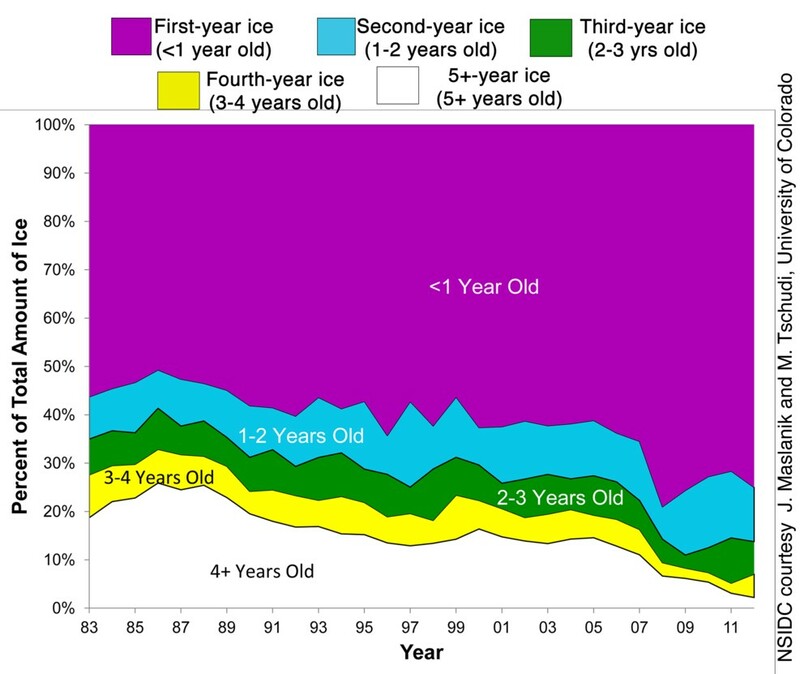 It's ice over 4 years old that's really declining with ice up to 2 to 3 years old being relatively stable. I think this is pretty much on the ball. It won't be until we see regular ice free events that the maximum lifetime of ice will be down to one year. It may not so much be a case of you not being clear - it may be me being slow and tired. If you've not read it yet you might find my most recent blog post interesting. I'm having a night off now. I can certainly buy some fraction (e.g. 4+ year old) falling below a threshold, if that is what you are saying. You had some figures in that table which might turn out a graph that makes this clearer. The simplest model of ice melt in a linearly warming environment produces a quadratic decline in the amount of ice at the end of each melt season. You do not need to include any feedbacks, positive or negative, to get this result. Hence, given that the amount of ice is declining in a quadratic fashion there is no evidence that any feedbacks, positive or negative, are yet operating. You can test this yourself. I can email you the excel spreadsheet that shows what happens to ice volume in an environment in which temperature is linearly increasing. 1.) Refreeze always equals some value, F. 2.) Melt equals some value M + yZ, where y is year and Z is the slope of the increased melt each year. Note each year slightly more ice melts - a linear increase, mapping directly to a linear increase in temperature. Put this in an excel spreadsheet. Iterate for a number of years. Plot the graph of minimum volume. You will see that it declines quadratically. "So do you think ENSO could account for the Spring warming, rather than the spring warming being due to ice thickness?" Yes and no. ENSO's impact is largely cloud driven (new hypothesis) and also heat exchanges (the old way of seeing things). But you are right, Ice thickness is extremely important, no trivial matter, there is a couple of papers out there, not many, which essentially show that there is heat exchanged from thin ice to atmosphere as opposed to typically thick multi year ice (hardly any). A wider area of thin ice over the Arctic Ocean weakens the buildup of winter and allows the penetration of southern Cyclones to further delay ice accretion. It is an intricate feedback loop. So a recovery to near 100% extent is meaningless without volume, care must be taken to also observe the frequency of Low pressure systems penetrating the North Pole region. This was the case this year, an onslaught of cyclones kept the Arctic winter very warm particularly from European side (remember they were complaining about how cold it was?). The ice was set up to disappear this summer months before sunrise at the Pole. It may be simple, it is also wrong. Run back in time: there will be a similar decline in ice in a linearly cooling environment. I am not sure that I understand. If I change the sign of the slope to negative (indicating a linearly cooling world) sea ice increases, as expected. Could you clarify your criticism? A quadratic function is a parabola: if it declines in the future it is going up in the past. Your spreadsheet should show that as well. I understand that if you extrapolate a parabola into negative years then that happens. However, mathematically, whatever year you wish to start at you simply define that as 'year zero'. Then that issue goes away. Usually, the year that you start is simply one where the melt and the refreeze were equal - in other words, an equilibrium world. Then you model heating (or cooling) from there. The simplest way to model what happens in a cooling world is to set the world to a cooling world (which just means changing the sign). In other words, when there was no warming, there is no parabola - just a horizontal line. 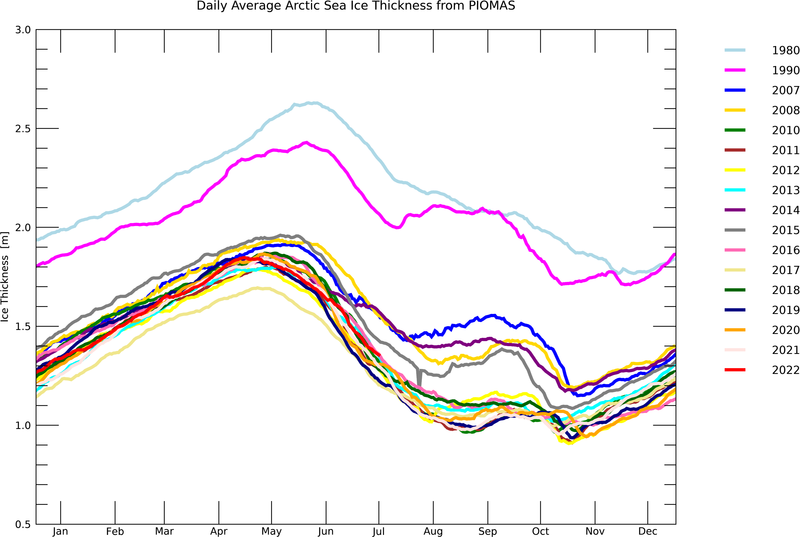 When the warming starts, the shape of the ice decline is a parabola curving downwards. When the cooling starts, the shape of the ice increase is a parabole curving upwards. How convenient. Sorry, in your world someone might eventually invent negative numbers and ask what was there before 'year zero'. It is not forbidden, but such choices are arbitrary and stop making IMO it the "simplest model of ice melt in a linearly warming environment". Do you realize that your simple model has (after 'year zero') no equilibrium? Once warming stops, melting will continue, now in a linear fashion. The end is always the same: zero ice. Mathematically, you can define whatever year you want as 'year zero' - whatever model you use, that is the case. However, it makes sense to define 'year zero' as the year in which melting starts: after all, your model is modelling what happens when temperature increases. As for what you do in the years prior to that year, they are ruled by a different function - y = C, assuming that the temperature is not changing. That instability emerges because you need to demarcate between warming, cooling and equilibrium periods. Again, set the year to zero when there is a change. You will see equilibrium. If you do not believe me about this, create a series of numbers , 1 to 10, increasing by 1 at each step. Then graph them in excel against 1 to 10. Use the 'show trend ling equation' function on the graph. Note the equation. Then change the numbers on the x-axis to -4 to 5. Oh my god! All of a sudden the intercept of the data changes! Something must be wrong with the model. After all, setting any start point as the zero year is arbitrary. Wherever you put your zero year is 'arbitrary'. However, if you do not believe that my model is simple, give me any sequence of warming, cooling and stationary years and I will create very rapidly the graph from my model that to show what happens with ice. This 1991 paper by Rudels, Larsson and Sehlstedt discusses in considerable detail the temperature and salinity structure and its transformations during the freeze-thaw cycle. Another complicating factor is apparently that extensive areas are very shallow and therefore the processes are not the same in different parts of the ocean. Medium salinity and relatively warm surface water is siphoned off the Northern Pacific by way of the shallow (50m) Bering Strait. It forms a distict layer below the topmost mixed layer. In open sea conditions these layers develop a stronger interaction, driven by wind effects. I guess my main point is that there is a major difference between the physical processes that exist in an ice covered or an open ocean, in addition to quite different sea/atmosphere interfaces. I think I did: stop the warming at any time (after 'year zero') and continue. At what equilibrium does the volume stop, in F,Z and y-end?